Satan turns up the thermostat while making himself a cup of hot cocoa after this mornings ice-capades. And Wally is studying at school. While I’m here slaving away? Get the F*** out of here. After telling people what you study and they think you will become a pilot, stewardess or an astronaut. You are not surprised if there is a 7th-year student in your 2nd year project group. When your last 4 Deans have sworn to “reduce study time” into their welcome speeches only to give up within 3 years. You start telling engineering jokes, a concept you thought was horrible at your arrival in 1st year and swore to never do something like that. The functions are out partying on Friday night and things are getting wild! Except for a bunch of emo functions standing alone in a corner, who don’t appear to have fun. An explanation to the uninitiated: Twilight Vanquisher is the highest current goal you can reach in World of Warcraft in its current state. In the different reincarnations of the game there have been different ultimate goals. Ragnaros at the beginning of WoW, Neffarion later on and C’thun was the last one before The Burning Crusade expansion. That incarnation had its own progression of ultimate bosses. During neither TBC nor Vanilla WoW was I able to get the ultimate end boss of the time. Though my guild did down Illidan, the intended ultimate boss in The Burning Crusade. With the Launch of World of Warcraft: Wrath of the Lich King getting the Twilight Vanquisher title by Killing a dragon with 3 smaller dragons at the same time is currently the highest attainable goal. This little link will stay active for two weeks for people that are as big a geek as I am. Last friday I received an email that I was not allowed to participate in the final project of the 3rd year. The pre-requisites for this is to finish your 2nd year. But as I have my 2nd year finished I didn’t expect any problems with this. I was allowed to use Japan as an internship as an exception (normally you have to have finished your DSE before being allowed to do internships) as I had all the requirements to participate in the DSE eventhough I hadn’t completed it yet. If I was not allowed to participate you can paste 1 year on my studies. No buts, no excuses. 1 year. And I’d have to fill my year with . . . any coarse I don’t finish now. Which may be as many as 2. What if there were new rules? What if some points were depreciated? What if I have not known of the existence of some course for all these years? What if some course I passed now no longer exist for the 2nd year? It was an administrative error. Probably caused by my being at school during 3 different systems for judging the Bachelor. The name of a festival that started this last weekend in Lille. As I understand it Lille was the cultural capital of Europe in 2004 and they liked the attention they got so now, 5 years later, they once again organised a grand festival to attract cultural . . . stuff to Lille. Or something like that at least. All I know was that I had to go to Lille because Raphaelle couldn’t come to Holland as she had to sing. Perhaps I should have done some more research into the thing. I hadn’t quite grasped the scope of the festival. The thing I went to was the opening ceremony of the festival while the actual thing will last ’till summer. Perhaps there is interesting stuff to come still. Things went much as I had expected during the afternoon. There were some statues. Some animal activism. I took some nice pictures of Raph and the rest of her choir. Though the rhythm of the chattering teeth wasn’t quite in 7/8 things sounded quite good. The night came and it was quite a bit more crowded than I had expected. The baby statues’ street was made blue together with this square. But lots of people and some blue paper machÃ© over lamp-post does not a Festival make. A giant internally glowing . . . well Giant does. Or at least it makes a decent starting point. The dude just sorta walked along the square squishing people that didn’t get out of the way fast enough. He was followed by a ball and another giant. There was a drum band as well but they were hanging in a black sky with some lights on them. Didn’t really make pretty pictures. While the giant came past a wall of people came up to greet him. Further on was a choir of 700 people singing their lungs out. Due to poor lighting conditions I have some pretty yellow smudges on my computer for the people that really want to see it. Though one of the singers put some of those up on her website. After that the singing the Giants took their leave and I had to undertake a measure of counter-survivalist behaviour. Going toward big flames with cannonfire is something that has been tagged as a really bad move by countless successful generations before us. Yet I made my way towards it. I should have listened to those nagging genes in the back of my head. 10 minutes later I was in a tightly packed crowd as the wind shifter and I got all the smoke of 2 giant bonfires in my eyes. Beyond the fire (or in my case after a 10 minute detour. There really were a lot of people about) there was the closing fireworks. All in all I would say that it was a nice opening for a Festival. Next post: Paris, here’s already the link to the pictures. Well, if crime fighters fight crime and fire fighters fight fire. What do freedom fighters fight? Sitting there looking rather dull in between my other pictures is Sakurajima. We asume Sakurajima is named after all the sakuras that stood there. We know jima is Japanese for island. 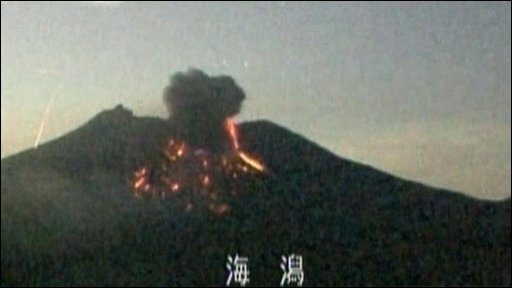 Since the 18XX eruption of sakurajima (the vulcano, not the island) it is a rather misnomer. No island (peninsula now) AND no sakura trees. Truth be told I’d seen pretty mountains before. I’d’ve much rather seen this. Knowing now of course that there were no casualties.